Yeah, I know, it sounds funny. 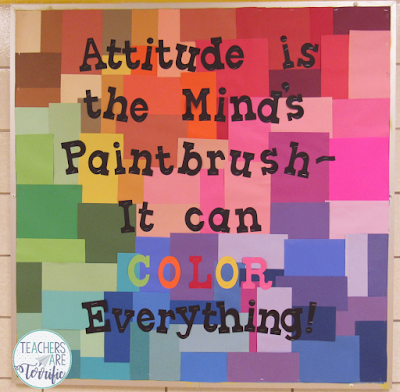 But, you've made bulletin boards, right?! Sometimes they are inspirational! This one was so colorful and bright we left it in the hallway for a very long time. Some are welcoming and just decorative. Even though this one is rather simple I love it. It gets the message across and just has a great look. Plus it was super simple to make! In your classroom, you also have the ones that stay up all year, like the Calendar or kid's work. Then....there are the ones in the HALL. The ones you are assigned to complete. Those are the challenging ones. I think it's because we want them to look spectacular because everyone sees them. So, when I have one of those to decorate I really work hard to make them fabulous. This balloon one was really easy to make. I bought the little house and covered it with scrapbook paper and the balloons were purchased at a school supply store. The cloud paper was also purchased at the same store. 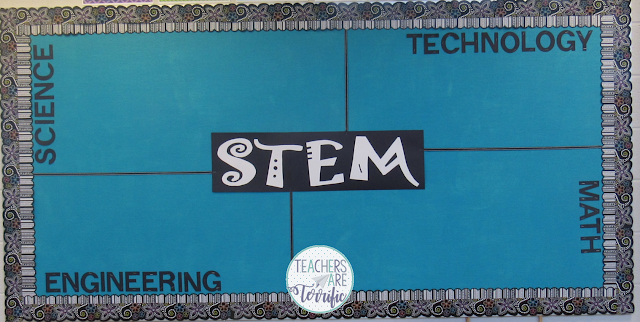 And that brings me to the subject of this post about bulletin boards. First, I have to explain that our hallway boards are very large. We are talking about GIANT bulletin boards. Not the little square things or side panels by your white board. I am talking big. The inside length measurement of the boards is 90 inches. 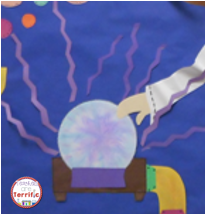 So, I went to the all-knowing, most amazing place ever to find ideas for bulletin boards- PINTEREST. I found, of course, ten tons of cute boards, including all those pictured above (and those are all my re-creations of pins I found). "Ah Ha!" I said. "I can make that!" So, first I started with the scientist lady. I needed a lab coat. Easy, I just used chart paper, drew it free hand, cut it out, and then cut a slit and folded back the jacket lapels. Easy, peasy. Well, the one in the photo has stuff in her pockets. I decided to make the pockets actually functional and put objects in them. So, I made two beakers and colored them with markers. Now, for the face. I cut out a head and added some background hair. The eyes were easy, and I made a dimensional triangle nose. But I cannot draw a mouth. So, I got the lip gloss out of my cabinet that I keep in there just for picture day. A good coating of that on MY lips and then I just kissed the drawing. The 3-D hair is just strips of brown paper that I cut and then just stapled in place. I made curlies for around her face. The hand that you can see was rather empty so I made a hand lens. You can't tell, but it actually has plastic inserted in the black paper...I'm a little OCD, what can I say? Then it was time for the pipes. Look back at the original board. The outside edge is a pipe that runs all the way around. It is connected to the static electricity ball and then has a few places where the open pipe is spewing bubbles. So, I cut strips of yellow paper and made the piping. For the corners I just made it rounded and then I added the open pipes. The yellow paper was just entirely too bright, so I coated it with colored chalk and rubbed it lightly with tissues and it now looks a little tarnished. I added pipe fitting connectors in yellow and bright colors. My favorite thing is the photos. I added six little squares to the pipes and used photos of the kids in the lab. I can change the photos occasionally and leave this board up for a while! The bubble dots were easy- just cut them free handed and drew around the edges with sharpie to make them cute. The easiest part was the static electricity ball. I just cut a circle out of white construction paper and colored it with colored chalk. Then I wiped that down with tissue and just kept doing that until it was the way I liked it. The electric bolts are just zig-zagged purple paper. I added a pipe to connect to the other pipes and it was done. Last, it needed a title and I went with "Mad About Science". For the letters I wanted a cute font, so I made my own letters and cut them out! Yeah, well, it's pretty awesome. But is it four HOURS awesome? Actually, I think it turned out pretty cute! I took the board above down at the end of the year and then re-did it in a new place. 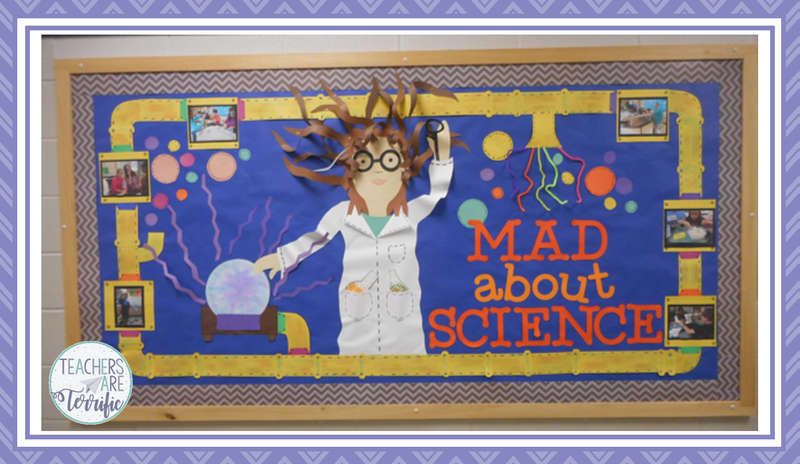 or here is another post about bulletin boards! And because I love making these so much I created a few more that you can also re-create! Just click on the image below! 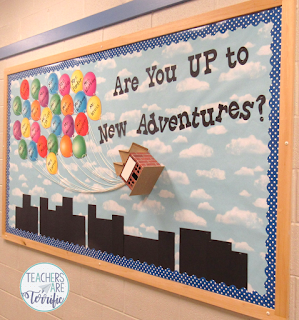 I am in love with your bulletin board! I mean it. I have three outside of my room and two are empty... I might try to be a copy cat up here in Wisconsin! Hey, I copied it from someone else- modified it to fit my space! Go for it! 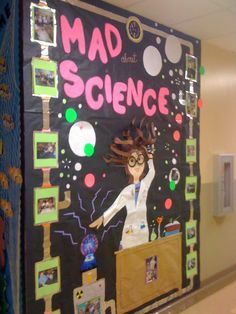 That bulletin board looks awesome! Definitely worth the 4 hours in my opinion. I really like the circle one you are doing next too. We don't have hall ways at our school so no boards to do, well except the ones in my room of course...lol. I am soooo doing this! Great job! I love this board! I will be doing this to display the best work samples of my students. Thank you for sharing. Love your board, it is awesome! Can you tell me where you got or how you made your lettering? 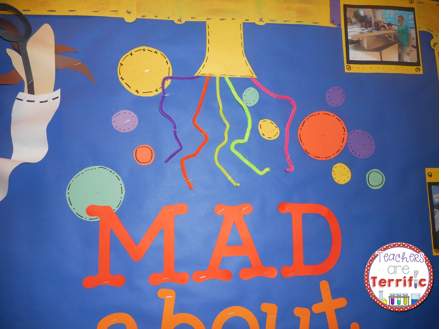 The letters on the Mad Science board were made with a Cricket machine using scrap book paper! Thanks for visiting! Bulletin Boards and Tennis Ball Towers!